The Nutribuddy Sculpting Protein Shake can be made in just seconds by adding some plant-based milk – but did you know you can blend it up with some fruit for a super boost of vitamins and antioxidants? 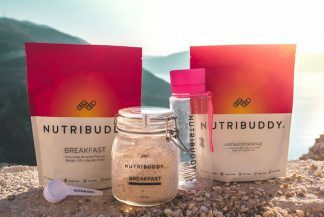 – Nutribuddy Sculpting Protein is low in calories but packed with protein, leaving you fuller for longer and helping you to resist unhealthy snacks. Oh, and did we mention it’s completely vegan, cruelty-free, gluten-free and organic? Winner! First, make the carrot juice by adding the carrots and a cup of water to a blender and blending until completely pureed and smooth. If you need to, add more water as needed. Then, add the rest of the ingredients and blend until smooth - it's that simple! This delicious, fruity protein smoothie recipe is the perfect pick-me-up breakfast. And, psst, we’ll let you in on a little secret… it’s great for a hangover, too! Haven’t tried the Nutribuddy Sculpting Protein yet? Our delicious vegan protein shake is cruelty-free, gluten-free, 100% organic and made from only whole foods – we’re super proud of our high-quality formula. Why not try it out for yourself? If you don’t like it, we’ll swap it with our happiness guarantee!